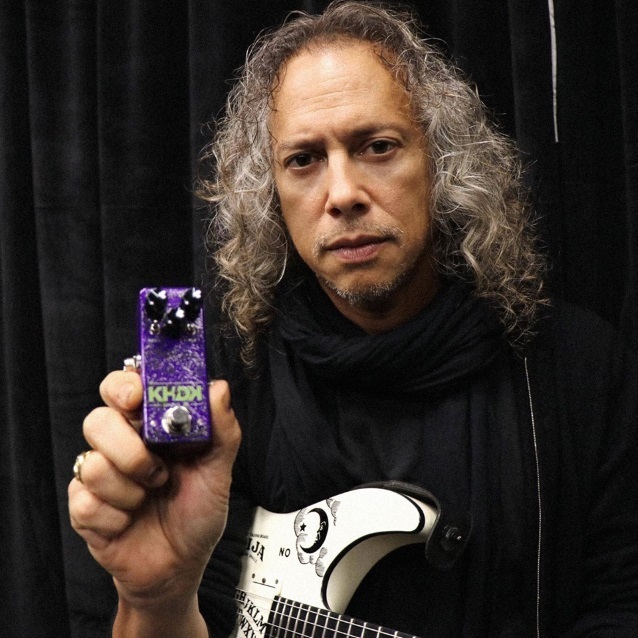 In celebration of co-founder/guitar legend Kirk Hammett's recent birthday (November 18), KHDK Electronics has unveiled the latest addition in their lineup of award-winning pedals. Inspired by their celebrated Ghoul Screamer, Ghoul Jr is the tone lab's first mini pedal: small, but lethal. "Evil things come in small packages," commented Hammett of Ghoul Jr.
Ghoul Jr is a hyper-powerful overdrive circuit coiled inside a micro-sized box, delivering massive overdrive with a bonus dose of gain that, incredibly, goes past 11. The glittering purple enclosure boasts a ghoulish face created by San Francisco tattoo artist Tim Lehi. 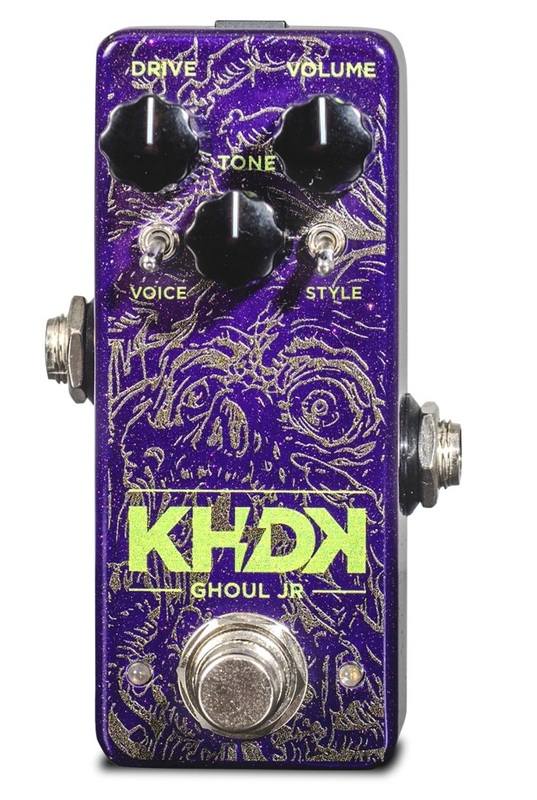 To purchase Ghoul Jr, please visit khdkelectronics.com. The micro pedal offers a wide range of colors from fuzzy vintage treble boost to creamy, liquid tone. A brand new full-on mode brings an even more powerful cut-through sound, ensuring the Ghoul Jr never gets lost in the mix. "Flick the Style switch down and wreak havoc," advises Hammett. The mini pedal is bets used as a guitarist's main overdrive, for boosting an already overridden amp or to bring out the best of its neighbors on a pedalboard. 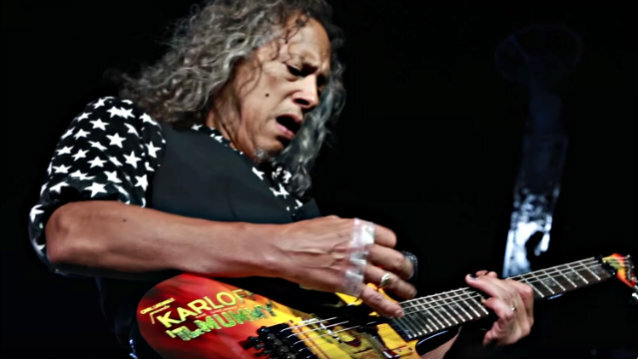 Ghoul Jr's release also marks the second anniversary of the launch of KHDK Electronics, founded by legendary METALLICA guitarist Kirk Hammett and industry vet David Karon. Working with world-renowned musicians to develop their products, KHDK stands for an exclusive lifestyle brand which caters to artists who are not afraid to push the envelope. Their goal is to create unique tones "for gearheads, by gearheads" from conception to prototype. Each pedal is crafted by head engineer Antonin Salva and manufactured in a family-run in Paducah, Kentucky. Ghoul Jr joins the existing KHDK lineup of six award-winning pedals, which includes two signature Kirk Hammett overdrives, Ghoul Screamer and Dark Blood, as well as a fuzz pedal Scuzz Box, a bass overdrive Abyss, No. 1 overdrive and No. 2 clean boost.